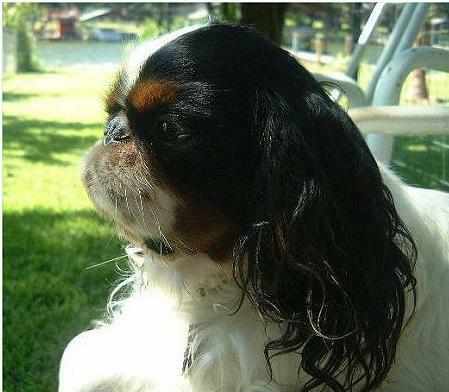 George is an English Toy Spaniel (Charlies)…in the states…everywhere else, he is known as a King Charles Spaniel. People get them mixed up with Cavalier King Charles Spaniels. The difference is “the nose”. Cavaliers have them, Charlies don’t. They are more like a Pekingnese. I found out and read about this breed and couldn’t find one. Then… I got a computer! It opened up a whole new world to me…in hundreds of ways. Anyway, I ordered a calendar that had the most beautiful dog in England I’d ever seen. I just decided to drop the owner a note telling him how lovely I thought his girl was. Much to my surprise he responded. Over the years, we’ve become very close friends. I am not into showing my dogs and am not a breeder. After a while, I was able to get George as a puppy from England. Many in the show crowd over here have tried to get dogs from my friend over there but he is very selective and guards his line closely. I still am the only person in the states who has some of his dogs. I have 3 from him now and one from France. Here is the photo that I saw on that calendar. She is my George’s aunt. She won at Crufts. George is the proud owner of Mrs. Ann Clark. He resides in Northeastern Texas by a lake. Lucky Dog! That is a great picture and a beautiful dog. We had an English Cocker Spaniel and she had a long, narrow nose. But, the long, curly ears like this one. She was all black and we loved her very much. Thanks for the story. Great blog by the way. .-= Amy Boyack´s last blog ..Olive Oil Cake Site Reviews =-.